Road bridge over the River Eamont crossing the old county boundary between Cumberland and Westmorland. Probably C15 widened 1875. Dressed grey sandstone with alterations of dressed red sandstone. Narrow slightly humped-back bridge of 3 segmental arches, the soffits originally supported by 4 ribs but with widening now 6; recessed voussoirs, supported on 2 splayed cutwaters continued up to form pedestrian refuges with solid parapets. When widened on the down stream side care was taken to use much of the old stonework. Parapet partly rebuilt in red sandstone. One of the oldest bridges still in daily use in the county. RCHM, Westmorland, 1936 p.250, which says it was rebuilt in C16, but there is no evidence of this and the bridge with its later alterations appears to be as constructed. 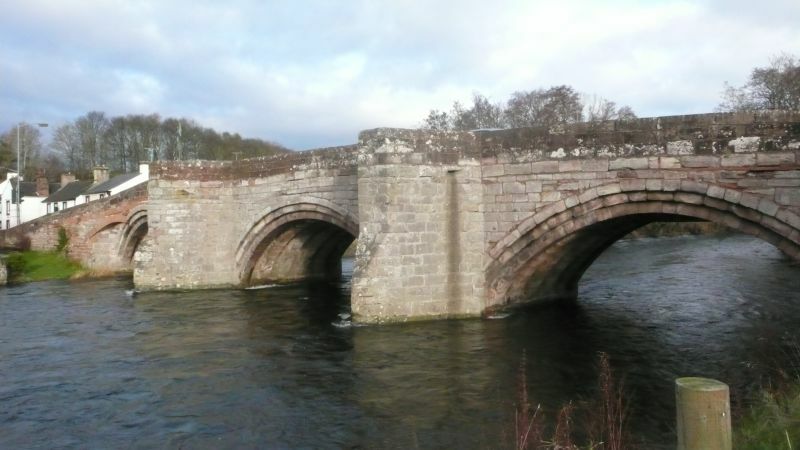 This bridge lies partly in Yanwath and Eamont Bridge C.P. Bibliography 3728 Inventory Of Westmorland (Royal Commission on the Historical Monuments of England), 1936, Page(s) 250.